The Motor Valley is known for igniting the passions of the motor industry’s most celebrated legends: it boasts a world of automotive titans such as Ferrari, Lamborghini, Maserati, Ducati, Pagani and 14 museums devoted to ultimate driving machines. You will discover it and visit the world’s most beautiful and precious collections of vintage cars and motorcycles. On the way, indulge in the genuine, welcoming Italian culinary traditions along rolling hills dotted with enchanting castles. Celebrated as the “foodie region of Italy”, In the Food Valley some of the finest Italian foods are produced: Parmigiano-Reggiano cheese, Traditional Balsamic Vinegar of Modena, Parma ham, and more! During this 8 days tour you will visit boutique food producers, have exclusive shopping at the market led by a local chef, enjoy amazing cooking classes and discover some behind the scenes secrets to learn how these fabulous food are made. 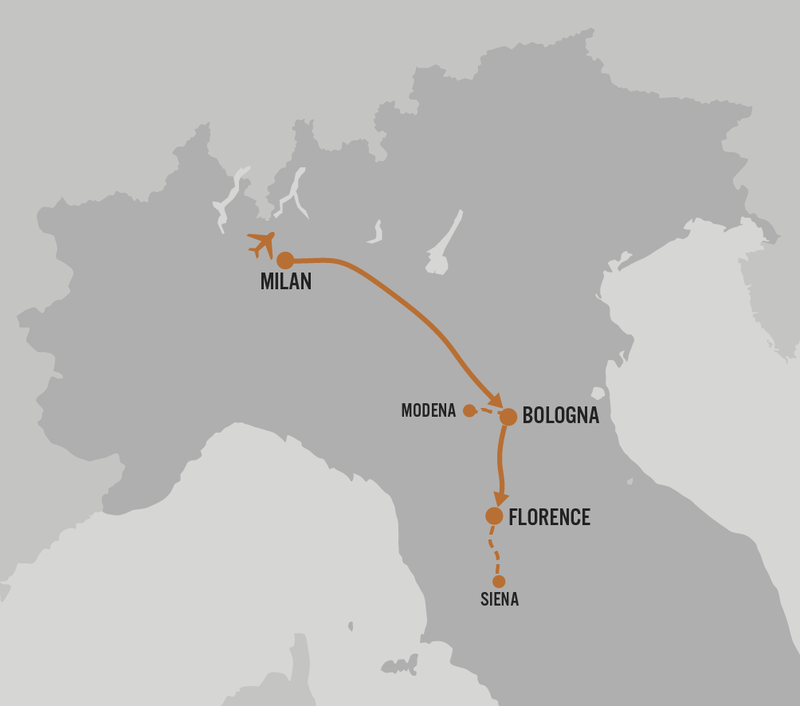 Then the journey continues toward Tuscany, ending with a short break to discover the secret corners of Florence, followed by a relaxing excursion in Chianti wine region. We had unforgettable experiences, without doubt our favorite was the balloon flight over Langhe hills!!! Lovely restaurant and awesome food everywhere: a delightful gourmet holiday! You can't get this in a guide book, not even from an average travel agent. We already had holidays in Italy several times, but it was the first time in the North West: a wonderful surprise, with unspotted marvelous places to visit! We have been to Italy many times, and this time we were pleasantly surprised to see something new. Thank you Marilena and Christian! We had a fantastic golfing holiday in amazing courses, together with well planned fascinating visits and relaxing time! We discovered art treasures we never heard before! We loved every single day of our vacation.